Colonel Ebenezer Zane, beginning with Zane's Trace, played a major role in the social and economic development of Ohio, placing it on the path to statehood. Current Ohio map shows Zane's Trace from Wheeling, West Virginia, to Zanesville, to Chillicothe and to Maysville, Kentucky. Zane and his brothers followed Native American footpaths to cut the first road from the wilderness in the Northwest Territory in the late 1700s. Colonel Zane, who founded Wheeling, West Virginia, and helped to settle Lancaster, Ohio, appealed to Congress for permission to build a road and he received that permission in 1796 after he had already begun the project. Zane requested and received from the American government land grants where the Trace crossed the Muskingum, Hocking and Scioto Rivers to pay for his surveying costs. The government agreed to his request, believing that a major road opened in 1797 would bring more settlers to Ohio and help increase trade. Zane's Trace, intermingled with what is now the National Road and Route 40, was the shortest distance between Wheeling and Limestown, Kentucky (present-day Maysville) on the Ohio River. In the early stages, Zane's Trace was wide enough for only a horse and rider but not a wagon. Many of the pioneers used the Rivers for transportation, so Zane built ferries at each of the river crossings. After having built a ferry at the mouth of the Licking River, a small town developed, eventually named Zanesville, which is the county seat and largest city in Muskingum County. 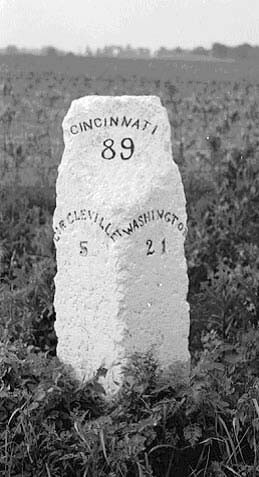 Milestone of Zane's Trace, on Route 22, Kinderhook, Pickaway County. Photo by the Historic American Building Survey. Courtesy of the Library of Congress. In 1800, the road was widened from Wheeling to Zanesville, but it was steep with deep ruts, making travel difficult. However, the Trace was the only major road in Ohio until after the War of 1812. In 1803, after Ohio received its statehood, the state legislature set aside money to improve Zane's Trace and make it accessible by wagon. Trees were cut down to make it 20 feet wide and bridges were built. Soon travel by wagon from Wheeling to Chillicothe was possible. Settlements sprang up along the way, with businesses such as taverns and inns that catered to the travelers. Farmers used the road to transport their crops to market. In Lancaster, Ohio, Zane's Trace crossed the Hocking River. German settlers used the road for their westward travels, many arriving from Pennsylvania. The Trace provided the way for such a large population of German settlers that by 1809, Lancaster was publishing a Germany language newspaper, Der Ohio Adler. Today, the National Road and Route 40 continue to use some of Zane's Trace as its path. Zane's Trace between New Concord and Zanesville can be driven in an automobile except for a section at the Zanesville Airport. The road is narrow and winding, and is an example of what the National Road and Route 40 were like before the era of roadbuilding that started in the 1930s.